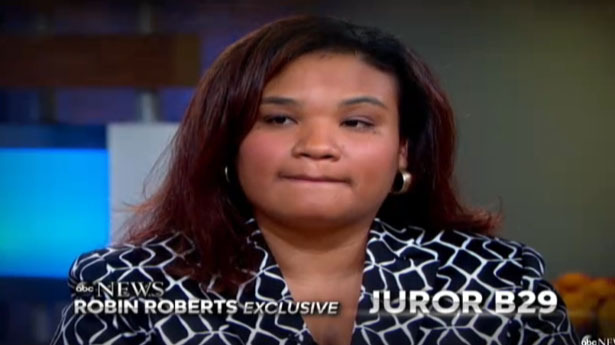 Today juror B29, the woman of color, broke her silence and essentially apologized for Zimmerman being acquitted. She say’s “I felt like I let a lot of people down…” and that there was “nothing we could do about it.” She even says that “George Zimmerman got away with murder.” Here is the thing, he didn’t have to and she had the power to make sure he didn’t. She even acknowledged “I was the juror that was going to give them a hung jury,” but she didn’t, it is worth asking, why not? This, to me, is the culmination and final manifestation, the proverbial nail in the coffin, for the argument that race had nothing to do with this trial. The only woman of color on the jury recognized that Zimmerman murdered Trayvon Martin and said as much when deliberations started. Yet, somehow she came all the way from Murder 2 to an acquittal… how does that happen? I would like to present two sources of pressure: the other jurors, all of them white, and the white supremacist legal system itself. I am not saying that the white jurors were consciously aware of their allegiance to whiteness, but I am saying there is such a thing. This allegiance comes via the worldview of whiteness (I wrote about that here). It accepts as normal the idea that Trayvon Martin would be deemed suspicious. It makes it possible to completely and utterly fail to understand and connect with Rachel Jeantel. It allows for the following logic: you can’t read and write cursive therefore you are not able to accurately tell the court what you heard seconds before your friend was murdered. In short, B29 had the weight of an entire worldview pushing on her. This worldview would not have been more tangible than in the idea that justice could somehow be found through the judicial system and that legality somehow equates to morality. Ultimately this aspect of white supremacy is what B29 succumbed to. Instead of doing what she clearly thought was right she allowed for the other jurors to convince her that the law didn’t allow them to hold Zimmerman accountable. It would have been good for the jurors to be reminded of, and for us to remember now, things such as: the 3/5th compromise, the Dred Scott decision, slavery in general, and Jim Crow were all products of the legal system. It is time to reject the idea that the judicial system does anything but entrench white supremacy. “There was nothing we could do…” These words should haunt each and every one of us. Perhaps the more disturbing aspect, though, is what those of us demanding justice for Trayvon and an end to white supremacy are supposed to be comforted by. B29 demonstrated this as well, “George Zimmerman got away with murder, but you can’t get away from God.” Sadly, this belief in justice being served in the hereafter is not new to oppressed communities; it is a staple of their realities. When your material and earthly reality is not offering you any recourse you are only left with a deity. I, for one, am not interested in justice being served in the afterlife. I would like to see some semblance of justice right here right now. It can no longer be acceptable to wait for God we must do it ourselves. We must continue to push, continue to organize, continue to reject racism, even when it is embodied in our institutions because there is no justice there is just us. You are very well spoken individual and are very passionate about what you believe. You write about ridding the world of racism when you yourself seem to be a racist towards white people. I read your blogs often and as well written as they are they are complete garbage. They way you speak indicates to me the race will always be an issue and you will do what you can to make sure that happens. One of your earlier posts about Paula Dean using a derogatory slang term almost 30 years ago was quite interesting but I want to know why you haven’t posted anything about Charlie Rangel and his use of the term “white crackers” regarding the Tea Party, is this a product of “Blackism”. Should I assume that all black people think white people are all crackers and still have the same mindset as those in the early 20th century. Just wish you would focus on both sides more often then just the side you are on, only if you are a true academic. And I truly hope you are not injecting your students with your opinions of society since they are just opinions. Peace Annonymous, I appreciate the kind words regarding my writing skills.Normally I wouldn’t take the time to respond to a comment from someone who refused to identify themselves but I think your comment is important. Let me start by saying this, I don’t believe racism is a two way street. I believe racism is a system of advantages/benefits based on race. That means that racism is not individual but rather systemic, some folks like to refer to it as institutional racism. I believe individuals can be prejudice and bias but that racism only comes into play when an individual colludes with the system of advantage, in this country that limits the potential racists to white folks. This does not mean that people of color can not be prejudice or bigots, they can. The example you mention actually illustrates just what I am saying: Charlie Rangel called a group of whites crackers and you ask why I don’t seem to care about this. Well, let me say for the record I don’t care. Why? Because there is no history of oppression nor power attached tot hat word. There has never been a law that says white folks can’t own property or drink from the same water fountain etc as people of color. This term simply does not conjure up the same power dynamics. Plain and simple.